And Justice For Art: Dan Seagrave paints the cover for the new edition of Albert Mudrian's book, "Choosing Death..."
Dan Seagrave paints the cover for the new edition of Albert Mudrian's book, "Choosing Death..."
Legendary British painter/illustrator/filmmaker, Dan Seagrave, (whose portfolio includes iconic artworks for Dismember, Suffocation and Morbid Angel) recently crafted one of his most finest, endearing pieces. 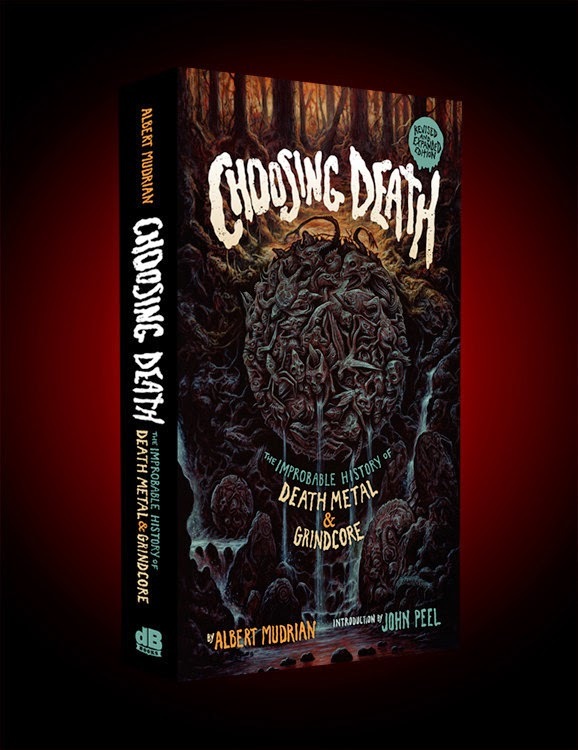 The haunting illustration was created for the cover of Albert Mudrian's new edition of the mandatory-to-read volume "Choosing Death: The Improbable History of Death Metal and Grindcore." "I had been involved slightly in the first edition of the book," Seagrave reveals. "Albert had contacted me back then to ask for some input on my part in the Death Metal scene. However, I'd not met him until 2014 when we both attended the event called Grimposium in Montreal." 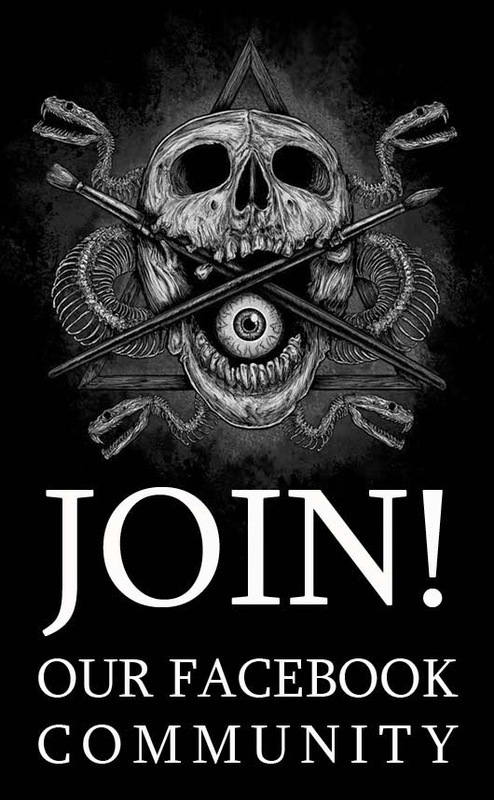 After that, both of them kept in touch and when the time came for a re-edition of the book, Mudrian (editor of Decibel Magazine) asked the illustrator about creating a new cover. 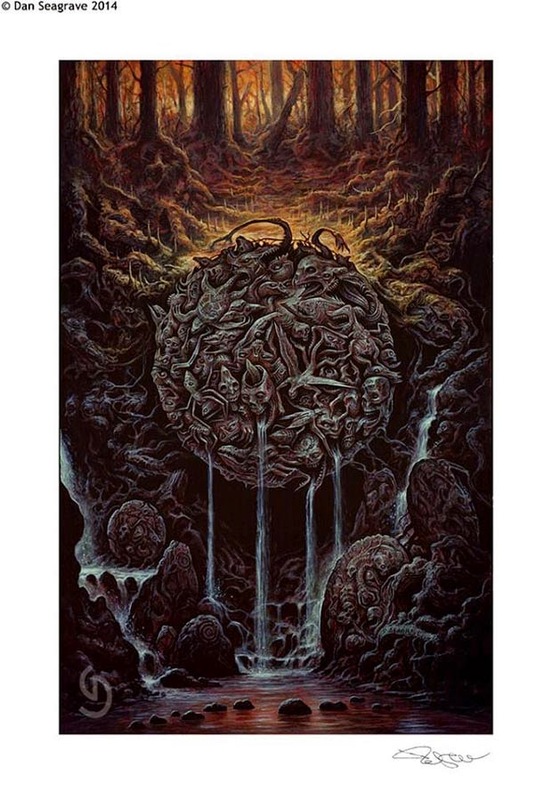 "Albert was interested in having artwork by myself that tapped into the essence of the work I had done in the original Death Metal scene. Not to copy anything or flaky reproduce the past, but something that felt like those covers. Albert pretty much left it at that. So really it was about creating a piece that I though would work, and feel like that era. " From such suggestion, a concept was born. "I had been somewhat curious about re-visiting the Morbid Angel theme I created for the Altars of Madness record. Somehow I'd thought about a follow up to that; that there was more to it. It seemed therefore like a strange opportunity to in fact do just that. So then it was about creating some kind of back story, and an idea of what this disk-shaped tablet was." That conceptual approach probably explains why the piece is titled "Origin's Of Madness." However, references from the cover of Entombed's album, Clandestine, are also noticeable. In addition, the strange communion between the organic and fantastical worlds—so distinctive of Seagrave's style— is also present. The Toronto-based artist explains that visually the main element of the new artwork is, "a similar disk artifact, and held within that are these characters, as if carved out of stone, but I think more like petrified specimens, long trapped somehow by the force of this object, and worn down by much time creating that slightly shiny carbon-like fossilized feel. Around and below this main structure lay other similar but smaller disks, to elude to there being many of these tablets. I never meant this to be spherical. It’s mostly a flat disk, not perhaps unlike the roman carving of the 'mouth of truth,' or the Aztec calendar... The slight waterfalls and pooling water, the trees above and that sun set almost dusk time of day evoke the cover art from Clandestine." Ultimately, "The Origins Of Madness" not only serves as a magnificent cover for one of the most important books about the development of Death Metal as a bonafide musical genre. It's also a stand alone piece of art capable of transcending its original purpose and cause awe and intrigue on those that look at it. The fact that was created in only two weeks using acrylics, makes it even more impressive. No doubt, it's destined to become a classic example of Metal's finest visual imagery.